Time for a weirdo card! This card has one effect, but it does all the things! It discards, then it sends from your Deck, then it banishes cards from the top of your Deck, then it sends a card you control to the GY, then it sends a card your opponent controls to the GY, then you take 1000 damage, then both players draw 1 card. Why do this? Because you bloody well can! Also, if you co-link this card, you get to avoid the more negative effects of your effect. Once per turn: You can discard 1 card; send 1 card from your Deck to your GY, then banish the top 3 cards of your Deck, then send 1 card you control to the GY, then send 1 card your opponent controls to the GY, then take 1000 damage, then both players draw 1 card. 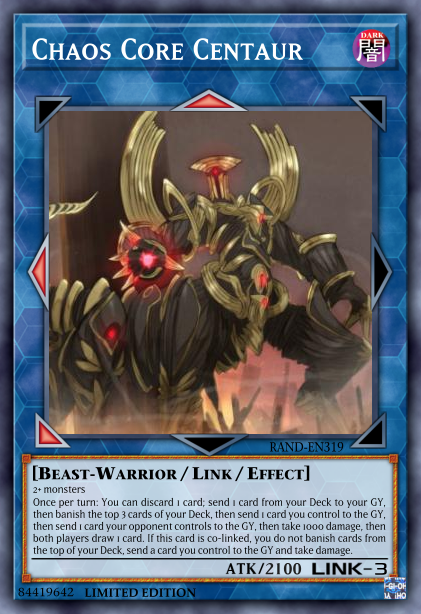 If this card is co-linked, you do not banish cards from the top of your Deck, send a card you control to the GY and take damage.